I think the first (and some of the only) hush puppies I had through my life were at a popular fish fast food joint. You know the one. The one were you have to order 'extra crispy-crunchies'. They were always one of my favorites when I was younger, but you know... times have changed and so have my eating habits. Vastly. In fact, I honestly couldn't tell you the last time I ate at that place last. Anyway! Earlier this year I was in charge of a 'fish fry' for the two first grade classes (and their families) at my daughter's school. The ironic part here is that I don't own a fryer (never have) and I don't eat fish (never will.) At the fish fry we had plenty of hush puppies to go around. Uuuuuhnnngggh... such a guilty pleasure. That got me thinking way back then... I should make some baked hush puppies! Corn bread and anything akin to it here in the south is basically an art form. So some might consider this whole 'baking' of hush puppies to almost be sacrilegious. Eep! I just can't help myself sometimes. You know I have to get my favorites in while making them as guiltless as possible. 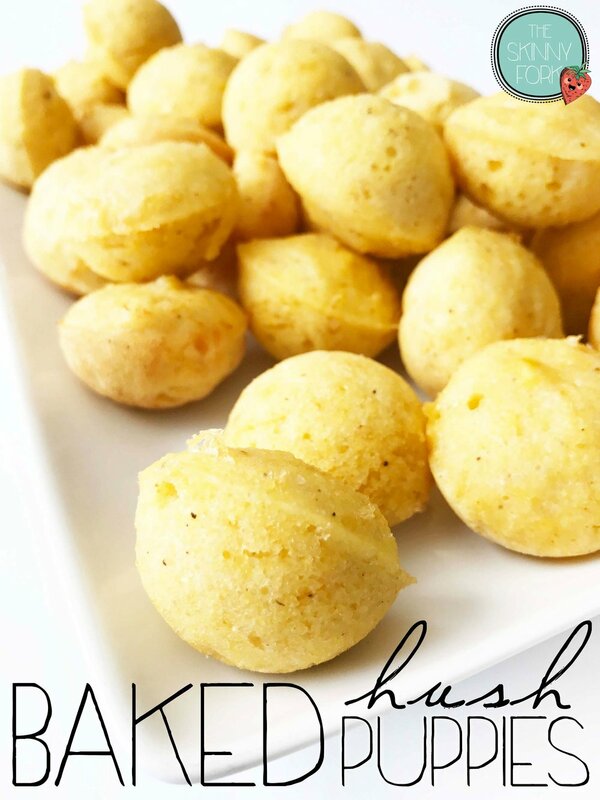 Trust me though, these baked hush puppies are not only easy to do, they are so sooo good! Originally I started them out with just 3 ingredients, but then I decided better of myself and through some shredded cheddar in the batter too. I mean... how can you go wrong with a bit of cheese? Easy, you can't! But, if you're looking to save a few extra calories feel free to leave the cheese out. I can't promise I won't cry about it though. If you make these guys a head of time, and you totally can, just remember to reheat them in the oven for a few minutes. I found that reheating them really gave them that extra crunchy exterior and that soft dense inside that traditional hush puppies are known for. I made these baked hush puppies to pair with My Great-Grandma's Red Beans, though they would be good with just about anything any other hush puppies or corn bread is meant for. I.E. chili, fried/baked fish, etc. Preheat the oven to 350 degrees F. and lightly coat the insides of a couple of 'cake pop' baking pans with non-stick cooking spray; set aside. In a large bowl, combine the 1 (14.5 Oz.) Can 'No Salt Added' Creamed Corn, 1 C. Self-Rising Cornmeal, 2 Egg Whites, and 1/2 C. Reduced Fat Shredded Cheddar Cheese. Season with Salt & Pepper to Taste. Scoop about 1 - 1 1/2 Tbsp. of the corn mixture into the bottom section of the prepared cake pop baking pan. Cover with the top and secure the lid. Place the pans into the oven to bake for about 18 minutes. Once done, remove the pans from the oven and allow to cool for a couple of minutes before opening and removing the cooked hush puppies. Rinse and repeat for the remaining batter.